A femoral neck fracture where the break is right below the ball (or head) of the ball-and-socket hip joint. The hip (head) is partially replaced (a hemiarthroplasty). If the patient has arthritis or a previous injury that has damaged the joint and they are well enough, a total hip replacement may be done for a femoral neck fracture. Intertrochanteric or subtrochanteric fracture where the break occurs where the thigh bone juts out. The fracture runs between or below two bumps called trochanters. The fractured bones are manipulated into their correct position, a large screw is inserted and fixed to either a metal plate on the bone or rod inside the bone. Recovery from a hip fracture is a lengthy process. The patient is usually discharged after one to two weeks in hospital. They need a lot of rehabilitative care each day and in some cases, nursing care for several weeks. 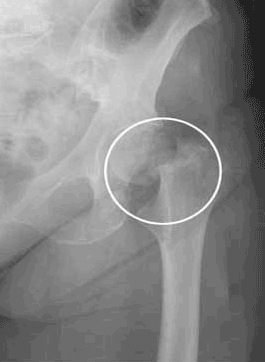 Up to a quarter of elderly hip fracture patients remain in a nursing home for at least a year. Diet is crucially important. The physiotherapy involves re-educating the muscles around the hip, strengthening exercises, balance re-training, getting in and out of bed and chairs and re-learning how to walk. Additionally, the occupational therapy focuses on domestic activities such as bathing, dressing, grooming and further mobility exercises. One quarter will fully recover after breaking a hip, about half require an additional mobility aide and one quarter will only walk with the aid of a walking frame and possibly assistance from a helper.